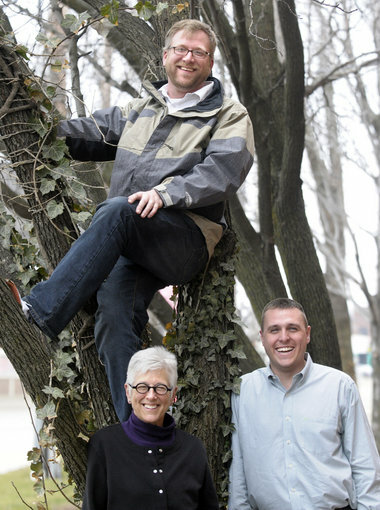 File photo | Mlive Media GroupSteve Faber, top, director of Friends of Grand Rapids Parks; Tyler Stevenson, lower right, a city forester, and Dotti Clune, chairwoman of the city’s Urban Forestry Committee, represent three groups collaborating with ReLeaf of Michigan. GRAND RAPIDS â Area residents who want to plant trees and shrubs on their property this spring can participate in two public programs aimed at greening up West Michigan. The City of Grand Rapids, Friends of Grand Rapids Parks, and the City’s Urban Forestry Committee are taking orders for their 22nd Annual Spring Tree and Shrub Sale through their partnership with Releaf Michigan. The city’s “ReLeaf” sale offers more than 40 species of trees and shrubs to choose from with prices ranging from $18 for shrubs, like lilacs and hydrangeas, to $50 for specialty trees, like Snow Fountain cherry and Regal Prince oak. The sale is open to city and non-city residents, according to City Forester Tyler Stevenson. “The ReLeaf sale is a simple and inexpensive way to contribute to a greener Grand Rapids,” Dotti Clune, chair of the City’s Urban Forestry Committee, said. Orders must be placed online by April 9 at releafmichigan.blogspot.com. Mail order forms are available at the city’s Parks and Recreation Department, 201 Market Ave SW. Trees will be delivered for pickup at Riverside West Park on April 28 from 9 a.m. until 2 p.m.
Releaf tree customers also can donate a native tree or shrub to a city park by including an extra tree on their order form and notifying Releaf workers when they pick up their plants. The Kent Conservation District also is taking orders for its bi-annual spring tree and shrub sale. Orders are due March 30 on forms that are available online at www.kentconservation.org. Trees will be delivered for pickup between 8 a.m. and 1 p.m. on April 14 at Kent Conservation District Offices, 3260 Eagle Park Drive NE.